According to Wikipedia, nearly ten million tourists each year pay a visit to Jordan, the country I’ve called home for the past six months. Whether to soak up the sun in Aqaba or to sweat their way through rocky ravines to glimpse the monastery at Petra, they come in droves: picture-snapping, shoulder-satchel-slinging, zip-off-pants-sporting adventurers from around the globe. And as a resident, however recent, I can’t help but feel touched. Other locals, though, take advantage of their homeland’s particular attributes, and one in particular capitalizes on visitors’ hunger for more than just exotic sights. Beit Sitti, located in the pleasantly hilly Jabal al Weibdeh neighborhood of Amman, the capital city, aims to give its patrons a holistic experience of Jordanian food, and it was here that I found myself on a recent, sunny weekend. The restaurant’s name literally means “my grandmother’s house,” and unlike so many similarly named joints across the country, it apparently actually was once the abode of our hostess’s grandmother. Maria, an effervescent Jordanian with a sprightly ponytail, welcomed our group of six at the top of the stairs and led us through a well-stocked kitchen to our battle stations. See, Beit Sitti is more than just a restaurant, and Maria is more than just a hostess. For the first ninety minutes or so of our lunch, we were doing the work: chopping cucumbers, peeling eggplants, kneading bread dough, and caramelizing sugar over a venerable gas stove. I’d call it a cooking class, but the experience feels more like that of a sous chef. With Maria’s careful and cheerful guidance, we completed the tasks that were basically impossible to mess up, and left the heavy lifting to the pros. No need to handle raw chicken or fuss over the oven; Beit Sitti covers it for you, resulting in a feeling of accomplishment only slightly diminished by the realization that all you really did for the lunch was cut stuff and stir stuff. I can’t complain, though. Maria’s grandmother definitely knew what she was doing. So we toiled on the pretty stone terrace, taking in the clear-ish Amman air and pausing to enjoy some wonderful homey touches courtesy of our hosts. 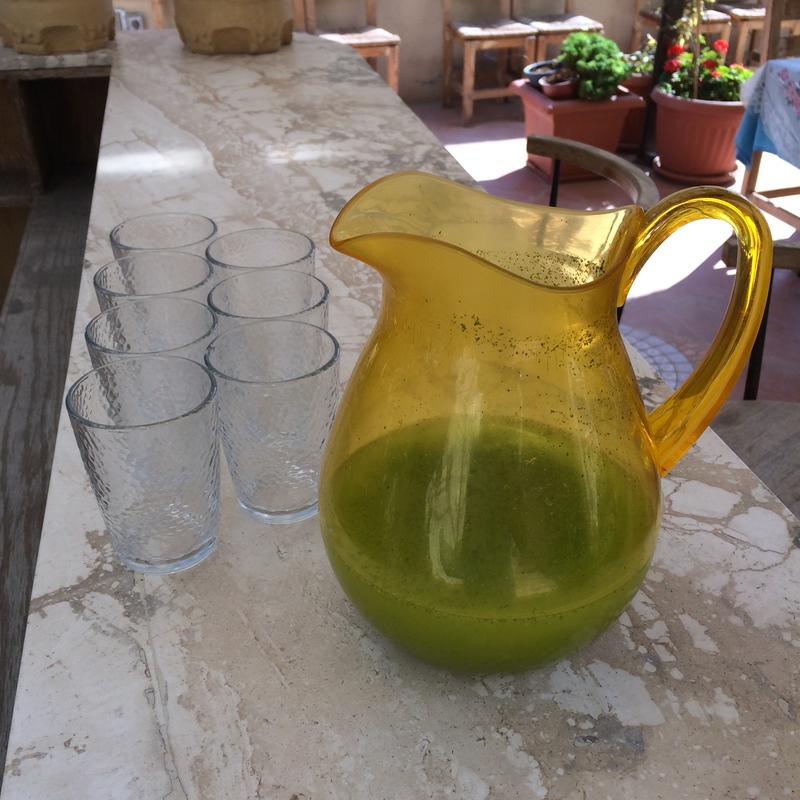 A neighbor from across the street opened her window to wave hello, and a jug of vibrantly green, mint-enhanced lemonade made its way to our table, the perfect pick-me-up as we assembled our feast. And what, pray tell, was said feast? So glad you asked. 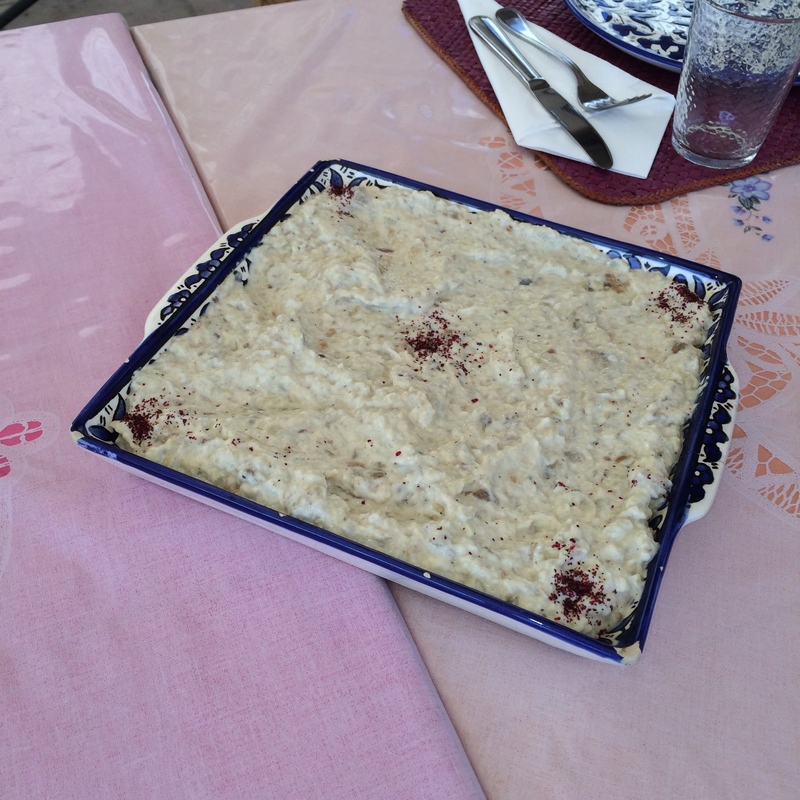 Our appetizer was moutabbal, an eggplant and tahini dip better known in the States as babaganoush (or baba ghannouj, or however you try to transliterate Arabic. After six months it hasn’t gotten any easier). Beit Sitti does this one right: by charring the eggplants over an open flame, we imbued this innocent-looking paste with a smokiness of Smaugian proportions. Gussied up with a sprinkle of tart sumac and a drizzle of olive oil, it was as beautiful as it was dangerous. I had a lot. 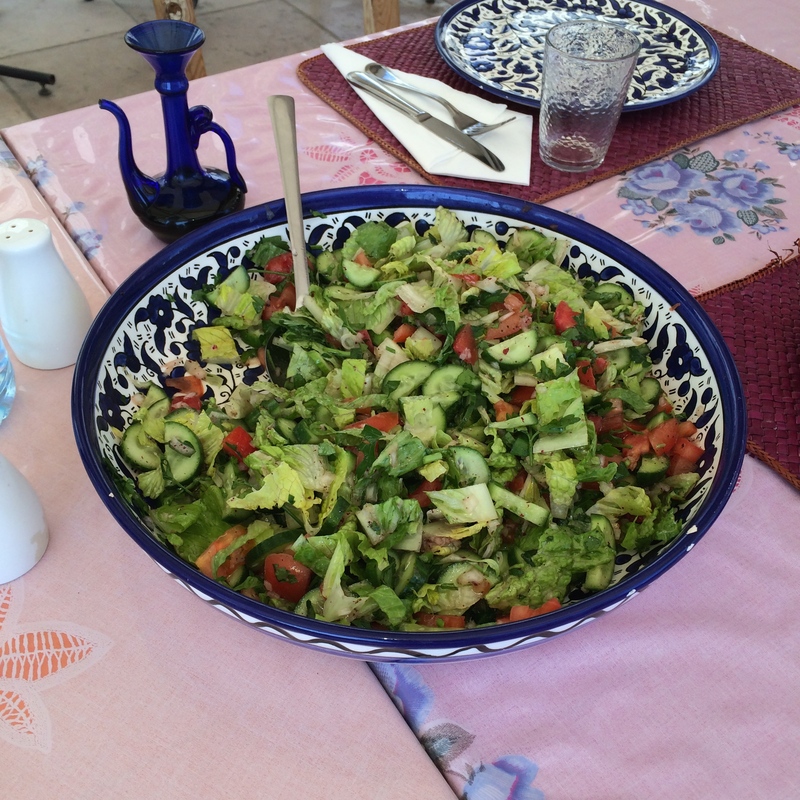 The salad that accompanied our meal, fattoush, is a Jordanian classic: lettuce, parsley, tomatoes, and cucumbers, with a dash of balsamic dressing and an adornment of freshly fried pita chips. Brilliantly simple and well-executed, though our varying levels of cucumber-chopping ability were quite apparent. Good thing no one expects fattoush to be a work of art. And for the main course? 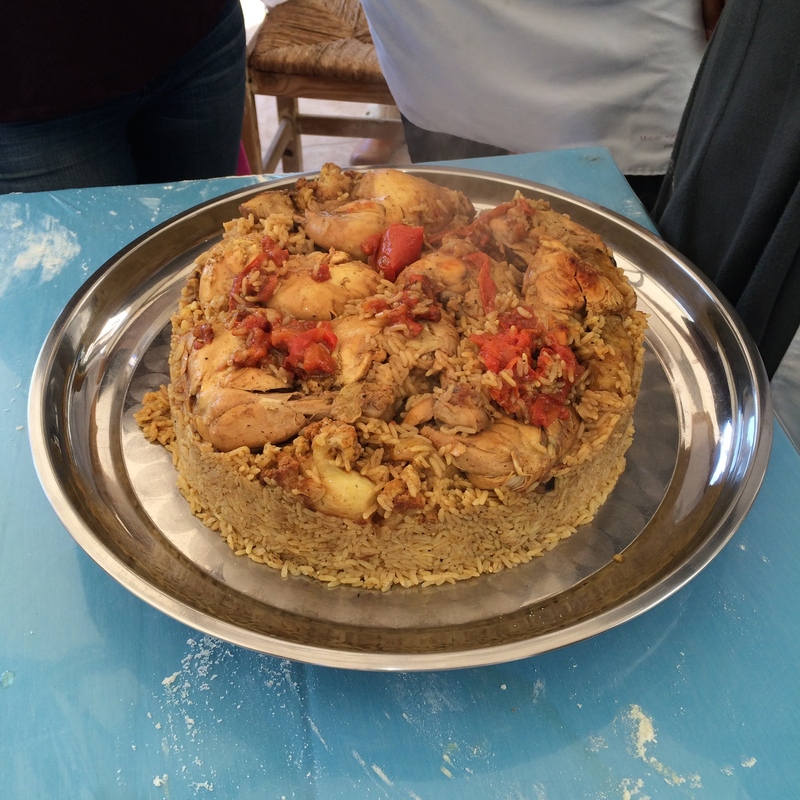 Yet another hometown favorite, ma’aloubeh, which I believe translates to “upside-down.” A stew of sorts that originated in Jordan’s farms and fields, ma’aloubeh is all about layers: from the bottom up, tomatoes, boiled chicken, thoroughly fried eggplant and cauliflower, and a cascade of rice, topped off with Beit Sitt’s elaborate spice mix (cinnamon, cardamom, and all manner of savory powders). Simmered low and slow with some chicken stock and oil from the veggie-frying, the whole shebang is flipped upside-down for a thrilling photo finish. The dish felt like a perfect reward for our efforts. Pleasingly monochromatic as comfort foods so often are, it did not fall victim to the blandness that such coloring can presage, instead filling the palate with garlicky notes and a just-right hit of sweetness from the cinnamon. Rice served in heaps, richly oily and given much-needed crunch by a sprinkling of almonds, was utterly addictive; I found myself reaching for the serving spoon whenever there was a lull in conversation. And though the white meat of the chicken skewed a little to the dry side, the problem was easily remedied with a forkful of cauliflower or eggplant. The vegetables lent a near-impossible creaminess to each bite and were frankly all too rare: I could’ve eaten a plateful of just cauliflower and been done for the day. 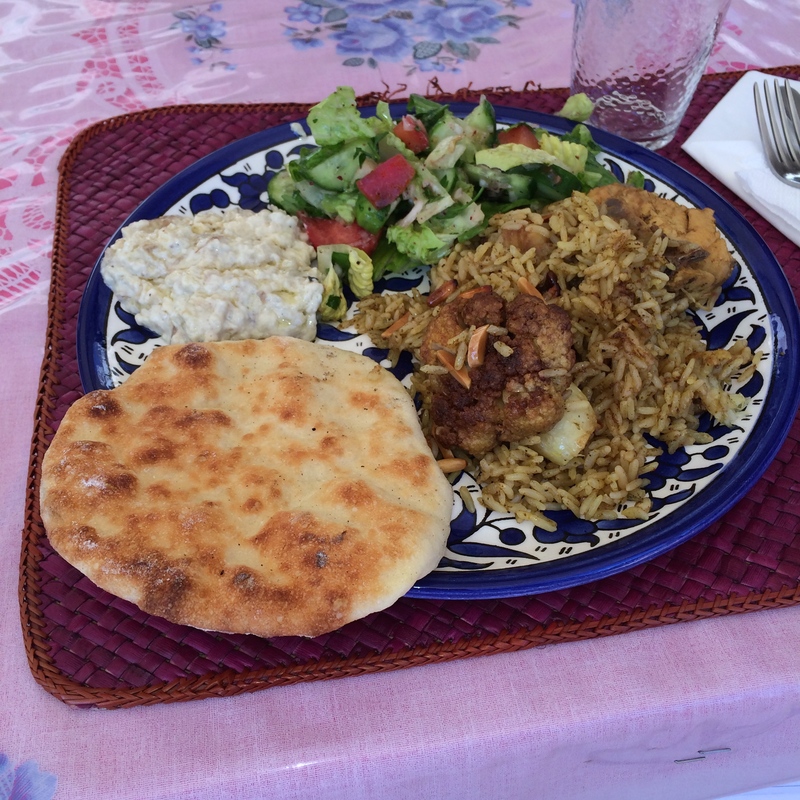 Here’s a picture of my full plate so you get the full idea, including our own freshly baked, just-puffy-enough bread. 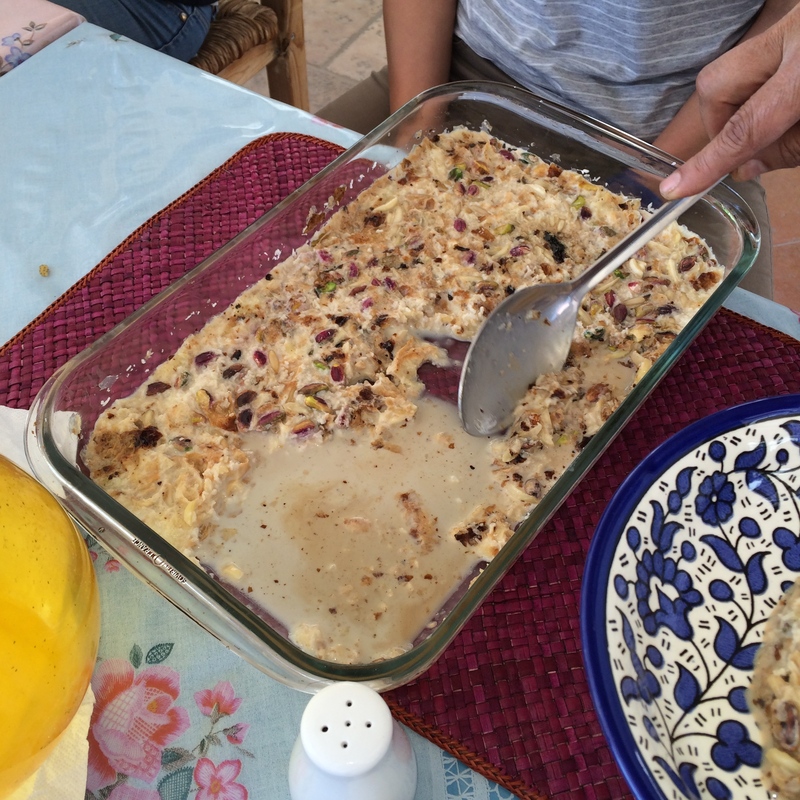 We finished off our meal with Umm Ali, which I have typically experienced as a sort of Jordanian bread pudding. This was something of a lowlight of the afternoon, as the dessert seemed to be unsure of what it was trying to be. Strangely crunchy from an overabundance of nuts and very light on puff pastry and raisins, it tasted pleasant enough, but didn’t quite come together. This, I suppose, is the thrill and the danger of cooking your own meal, and given that it was the only misstep, I can’t say I’m displeased. 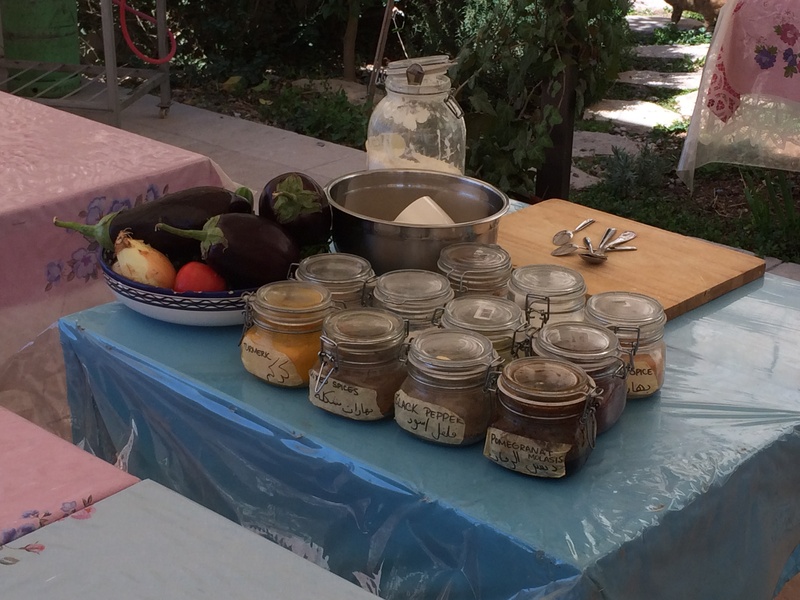 Beit Sitti provides an engaging and frankly quite educational tour of Jordanian home cooking, with the unbeatable reward of getting to feast on the fruits of your labors. I can’t recommend it highly enough for visitors to the country, and given their repertoire of dishes (at least three per course), I think it’s safe to say I’ll be back before long. And why not? There’s no doubt I’ll get a warm welcome at grandma’s house. An eater since birth, Plate-O only just realized his passion for waxing philosophical about what sustains him. Currently teaching at a boarding school in Madaba, Jordan, he has enjoyed delicacies of all stripes on all seven continents and harbors an ambition to someday catalog the best late-night drunk food in every country on earth. In his spare time, Plate-O grades papers, plans lessons, and thinks about the next time he’ll get to go hiking in Wadi Rum.